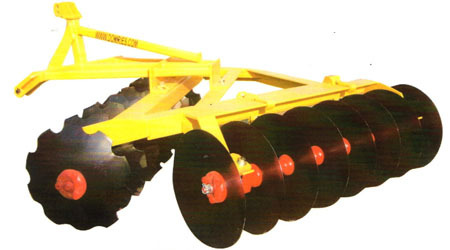 Specifications: blades 22" or 24" on 9" spacing, triple sealed bearings with wear guards, Cat I or II hitch. Sizes: 4'6" to 8'3". Weights: 820 to 1615 pounds. Options: blade cleaners and add-a-blade extensions. Features: Easy to adjust rear gang, extra heavy frame construction, offset to right or left. An ideal offset for small farms, cleanup on row ends of large open fields, landscaping or weed abatement jobs.